Do You Find Yourself in a Communication Pickle? Then Use PICKLES to Resolve It. I have often found myself in pickles with respect to communication. While I think of communication challenges as an opportunity to grow and learn to be a better listener and communicator, they can be extremely frustrating in the moment. I was pleasantly surprised that I could use PICKLES to get out of those “sour” moments. Last year at a parenting summit that my son’s school district does annually, I was introduced to PICKLES as presented by Kelly Duggan Shearer, LMFT. Its a method she uses in her own family and advocates not only as a communication tool but as a method to developing good interpersonal and problem solving skills. I love this concept because often times a problem isn’t really a PROBLEM but rather a challenge looking for a solution. Let’s break this down. In this example, you are really trying to understand what the other person is going through and truthfully from their perspective why the action that is frustrating is happening without a sense of blame. It is very important at this stage to truly just listen, actively listen without worry or what you should say next OR giving advice…advice at this point loses your creditability and their buy in. Whatever their response is try to repeat it back to them in different words to make sure you are understanding. “So what I hear you saying is the TV on downstairs is loud which makes it difficult for you to fall asleep. You feel as though that creates lack of sleep which causes you to sleep in later.” If you get it wrong and you sense frustration from your partner in the conversation, express you really want to understand what they are feeling and if you could try again. If not, its okay to table it until later. If you want buy in and their for have a greater chance that whatever the solution is to really be tried by your partner, then they need to place an active role. At this stage any idea should be considered but try to stick to 5 feasible ideas. The more your partner contributes the better the odds of them doing the final solution. In our late example, some solutions might be everyone goes to bed at the same time, ear plugs, a better alarm clock, take a shower before bed so you can sleep in longer, have the TV turned down, etc. This is really the evaluation stage and negotiating stage. It needs to first and foremost be doable. Second, it needs to meet your needs, your partners needs or at least enough of both so each party is satisfied. In our example, the solutions that will best meet everyone’s needs are the teen taking a shower at night so they can sleep in longer as well as potentially avoid the noisy TV but also turning the TV down to a reasonable volume that allows the teen to sleep. Communication takes active effort while talking is just a fast act. Communicating and maintaining relationship can be emotionally draining when they are strained but putting in the extra efforts of going through the above cooperative effort can go a long way. That said, it doesn’t stop their. Staying connected helps each party know theat are liked by the other. Schedule to watch a movie with them either in the theater or at home on the couch, to get ice cream or even sending them a quick note helps to maintain the relationship and to building an even stronger one. 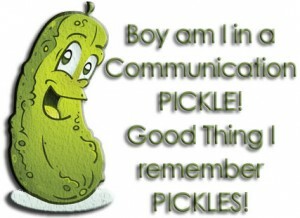 So the next time you are in a communication frustration pickle, just think of PICKLES.